Focus on positive energy and let go of the negative. Create a confident, happy mindset. Don't let negativity get you down. 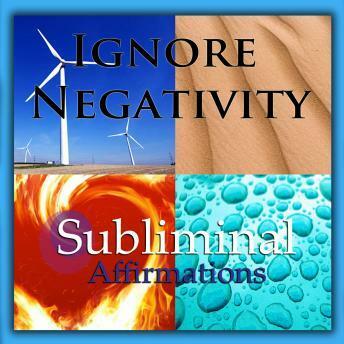 Rise above negative energy today with subliminal affirmations. This subliminal hypnosis program works for you on three different levels - positive affirmations will be spoken during your deepest state of open relaxation, low binaural beats that are almost imperceptible to the human ear work with your subconscious mind to anchor the positive affirmations to help you understand men better, and ancient Solfeggio tones encourage healing and wholeness with powerful harmonic frequencies. Along with seven different soothing sounds of nature, these three elements combined together are the triad of positive change that will propel you toward a better future. There are no relaxation suggestions in this subliminal hypnosis program, so you can listen at any time of the day or night. You may listen to the entire program as a whole or select only specific nature sounds that you enjoy most - the positive affirmations will still be effective for change.